As 2014 begins, we're continuing our GreenTech commitment to reduce our carbon footprint in all that we do. From packaging and shipping materials to logistics and customer service to lighting and equipment, here are just a few of the ways that ebm-papst makes good on our commitment to sustainability! We recently replaced all lighting in our warehouse with new LED lighting, which will significantly reduce our energy usage. Over the years we have gotten away from the use of chemically based InstaPak foam and moved toward the use of recyclable brown paper. We recycle and reuse wooden skids for shipments. We save all small cardboard boxes and dividers, to reuse them again. We have reduced our paper consumption by emailing purchase order confirmations and customer invoices, rather than mailing a paper version. 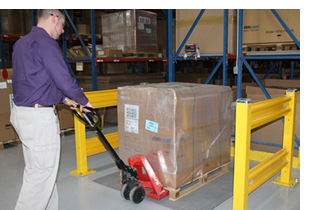 In our logistics center, we've replaced our older pallet scales with new state-of-the-art scales. The floor scales are not only more accurate, they're also saving energy! Our Logistics Center and Customer Service departments work with our customers to consolidate their shipments where possible. Bundling several orders together helps reduce the number of boxes and skids needed. 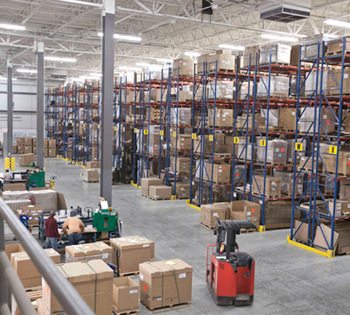 Our Logistics Center is equipped with motion sensor lighting in all aisles, helping reduce electricity costs. We continue to upgrade equipment, such as order pickers and forklifts, to more energy efficient models. As Director of Customer Service and Logistics at ebm-papst, Liz Callaghan enjoys meeting in person the customers with whom she’s developed productive relationships over the past 17 years. Her responsibilities include warehouse logistics, international purchasing and inventory control. A constant learner, she leverages her diverse experiences to anticipate and address logistics issues in advance, ensuring the best possible service to prospective and current customers.